If you are a part of our local community, than you no doubt have felt the presence of Commander. Whether Multiplayer or Duel, Commander can be seen around the store nearly every single day. Like all formats, Commander receives an update to its rules and banlists with each new set; and Oath of the Gatewatch’s release has heralded some interesting changes. Prophet of Kruphix has been banned. 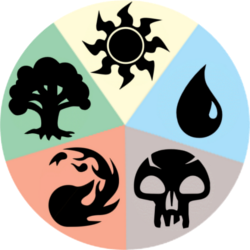 Players can now produce mana of any color, regardless of their Commander’s color identity. There is no longer a free mulligan before partial paris mulligans. We here at The End Games will be ignoring this update, to keep gameplay more consistent for players. While the first change is pretty self-explanatory, what exactly does this second change mean for me as a player, and why is this change necessary? The main reason for this change is due to the increased amount of colorless cards in Oath of the Gatewatch. 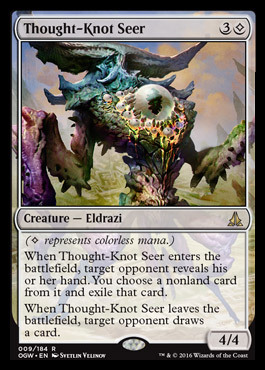 Under the old rule, if you had a City of Brass in play as a Blue/Black Commander and needed to make a colorless to cast Thought-Knot Seer, you could tap the City to make a Red, then the Color Identity Rule would kick in, turning the Red into Colorless. This is clearly not the intent of the rule, and so, it has been taken away to fix situations like this, as well as others caused by cards like Celestial Dawn. The Color Identity Rule still applies for generating mana. One of the big things for Duel Commander is the feeling of uniqueness between it and Multiplayer Commander. That being the case, the Duel Commander Rules Committee has decided to keep the Color Identity Rule in effect for mana as explained in our example above. So as long as you are not playing certain colors, you can still use your City of Brass and Birds of Paradise to create colorless mana. Keep your eyes peeled for another rules update regarding Commander in April, with the release of Shadows Over Innistrad!! This entry was posted in Articles, Magic The Gathering, Store News and tagged Charlottesville, Commander, Duel Commander, Kreitz, Magic The Gathering, The End Games. Bookmark the permalink. One Response to Jan 18th Commander Changes!! So is this an actual multicolor mana card?